Hemimorphite of a maroon color - from the dumps of the Hickory Cane mine. 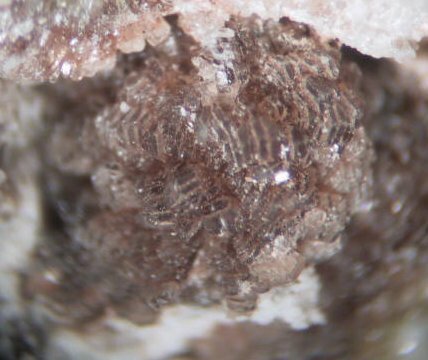 A variety of colors of this mineral have been found. Specimens are often associated with galena and cerussite, indicating they came from are area between 160 - 240 feet underground, where a galena zone occurred. Specimen was collected in May or October, 1998. Alan Goldstein specimen (1790) and photo. FOV = 4 mm.